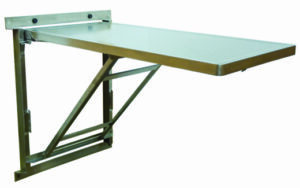 TriStar Vet offers a complete line of space-saving veterinary wall mount exam tables. In a busy veterinary practice, every square foot matters. It’s important to capitalize on the space you have to support the safe flow of foot traffic through your clinic. Whether your practice could use some side folding, fold up, fold down, or fixed wall mount tables, we’ve got you covered. 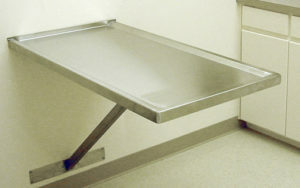 Each of our fold down veterinary exam table models is designed and fabricated to exceed your expectations. We pride ourselves on unbeatable quality, durability, and back-saving ergonomics. Veterinarians who choose TriStar Vet equipment have come to trust our unsurpassed design expertise and craftsmanship. All of our wall mount exam tables feature a foolproof tension release trigger for easy use. The exam tops are built from 18-gauge stainless steel for maximum strength and longevity. And all of them have a raised marine edge to corral spills and maintain a sterile work environment. The fold down veterinary exam table by TriStar Vet is solidly constructed to accommodate large and small patients. 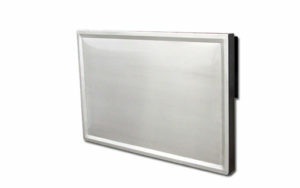 It’s ideal for small exam rooms, as it easily folds and stores when not in use. If you need to get a patient on the table right away, the tension release trigger is highly responsive and easy to use. 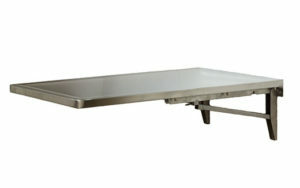 Our end fold down table is 20 inches by 35 inches. Some veterinary practices prefer fold up wall mount exam tables. Ours is sturdy and durable, perfect for any confined space. When flush against the wall, this table doesn’t protrude too far, which minimizes trip and fall hazards for vets and vet techs. Sometimes, clinical space is at such a premium that even end fold up and fold down exam tables are not sufficient to optimize a vet practice’s floor plan. Take a look at the side fold down veterinary exam table by TriStar Vet. It’s an engineering innovation that extends horizontally along a wall, instead of jutting outward at a 90-degree angle. Our side fold down table measures 20 inches by 35 inches. For superior user-friendly design, comfortable ergonomics, and reliable strength, choose TriStar Vet equipment. Contact our sales team today for your complimentary consultation, and download a free catalog to learn more about our fold down and fold up veterinary wall mount exam tables. Call 877.459.7827 or email sales@tristarvet.com.